Celestron's 9.25 optical system has enjoyed a loyal following since we first introduced it with our Ultima 9.25 in 1995. Now the 9.25 optical tube is even better with the addition of EdgeHD optics. The 9.25 is a favorite among astro imagers and discerning visual observers with it offering 33% more light gathering than our 8" model. CPC Deluxe 925 HD is specifically designed for astro imaging and optimized to reduce aberration across a wide field of view. 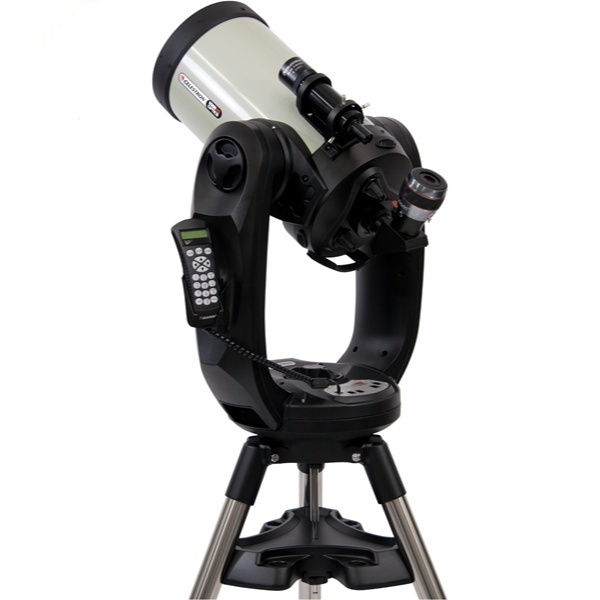 This feature packed model comes standard with Celestron's renowned StarBright XLT multi-coatings and is compatible with a complete line of Celestron photographic and visual accessories. New Optical Design The EdgeHD optical system combines all the compact power popularized by the SCT with an improved high definition optical system for wide field, astrograph quality images. As a visual instrument, EdgeHD optics deliver pinpoint images even with your widest field eyepiece. You can search for all of the Messier Catalog objects, and see hundreds of other NGC, IC and Caldwell objects with amazing clarity. For astro imaging, EdgeHD optics produce aberration-free images across your favorite CCD or DSLR camera. All EdgeHD optics are designed to produce an extremely flat focal plane precise enough to match the strict tolerances of the largest commercial CCD detectors, allowing stars to be in tight focus to the very edge of the chip. EdgeHD optics not only produce diffraction limited stars on axis, but maintain diffraction limited stars across the entire field of view of many of the most popular astro imaging cameras. Even at the very edge of a full frame (42 mm) camera chip, the CPC Deluxe 925 HD delivers diffraction limited stars of only 1 arc second. Learn more about the benefits and features of this new optical system by going to the EdgeHD web page. What makes the CPC Deluxe 9.25 HD unique for astro imaging? Longer focal length primary, and lower magnification secondary, creates a focal plane nine times flatter than a traditional Schmidt-Cassegrain with less coma and off-axis astigmatism. Internal baffle design optimized for astrophotography. Minimizes vignetting at the edge of the field of view. This reduces light drop off at the corners of your image plane. Celestron's Revolutionary SkyAlign Once the CPC's internal GPS has established the telescope's position, aligning the telescope is as easy as 1-2-3! Simply locate and use your hand control to manually point (slew) the telescope to three bright celestial objects. You do not need to know the names of the stars and you may even pick the Moon or bright planets! Celestron's NexStar™ software technology will model the night sky to determine the position of every star, planet and celestial object above the horizon. Once aligned, the remote hand control allows direct access to each of the celestial catalogs in its user-friendly database. Celestial Object Database The CPC Deluxe HD database contains over 40,000 celestial objects including Messier objects, the Caldwell Catalog, as well as NGC Galaxies, nebulae and planets. User-definable filter limits make navigating through this expansive database quicker and easier. Filter Limits let you filter out objects that are outside of your local horizon (ie, if trees or mountains were in the way). There's also "Solar System Align" that lets you align on the Sun or Moon for daytime observing – it is easy to use this to see planets or bright stars in the day. Luminos Eyepiece CPC Deluxe 925 HD comes with Celestron's top of the line, wide field eyepiece. With a 23 mm focal length and 82° AFOV, you get an incredible combination of power and wide field of view. Plus each Luminos eyepiece is optimized to deliver pin point images when used with a flat field telescope.